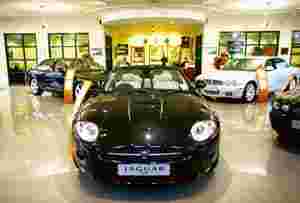 Seeking credit: A file photo of a Jaguar dealership. Tata Motors is also seeking retail public deposits of up to Rs2,700 crore, offering up to 11% annual interest for a maximum period of three years. Mumbai: India’s largest auto maker, Tata Motors Ltd has raised at least Rs1,000 crore from state-owned Life Insurance Corp. of India, or LIC, as it seeks funds, including public deposits, to part-refinance borrowings that funded the acquisition of marque brands Jaguar-Land Rover (JLR) from Ford Motor Co.
Tata Motors raised the money in November at an interest rate of 11% from various divisions of LIC, according to four people familiar with the development, who didn’t want to be identified. LIC’s unit-linked insurance plan (Ulip) division pooled in at least Rs300 crore and the life insurance division contributed a large portion, said one LIC executive, who didn’t want to be identified as he is not authorized to speak on specific deals. Tata Motors took a bridge loan of $3 billion (about Rs15,000 crore) to fund the purchase of JLR, which it is trying to refinance in tough market conditions. The company is currently seeking retail public deposits of up to Rs2,700 crore as part of the effort. According to speculation in the financial sector late last week, Tata Motors had raised Rs4,000 crore of debt from LIC through non-convertible debentures, or NCDs, but the Tata Motors spokesperson said the information is “incorrect". The spokesperson also denied that Tata Motors was trying to raise a Rs2,000 crore syndicated loan from local banks at a relatively high interest rate. Early in November, Standard and Poor’s (S&P) had affirmed its “BB" corporate credit rating for Tata Motors with a negative outlook; late last month Moody’s Investors Service downgraded Tata Motors to four notches below investment grade. “The rating could face downward pressure if the uncertainty related to the rollover or refinancing of its short-term debt is unresolved by March 2009," S&P’s credit analyst Mehul Sukkawala had said in November. The company raised about Rs4,150 crore ($840 million at current rates) through a rights issue that closed in October. The issue was largely subscribed to by its promoters, increasing their shareholding from 33% to 42%, after weak response from minority shareholders. When the company had taken the bridge loan in June, the rupee was at 42.40 to a US dollar and the rights issue of the same size in rupee terms would have helped the company garner nearly $1 billion. The gap is the impact of not hedging the bridge loan in the currency derivatives market, retail brokerage India Infoline Ltd’s institutional equities wing said in a late November research note. According to the report, a separate set of loans worth Rs6,140 crore are due for repayment in the next one year. Tata Motors, according to a newspaper advertisement, is offering up to 11% annual interest for a period of up to three years on public deposits. Under the norms that govern public deposits, Tata Motors can raise up to Rs2,700 crore. “We also believe that from the investor’s point of view it is an appropriate fixed income instrument, in the light of the current market environment," the Tata Motors spokesperson said. Earlier, Mint had reported on 24 November that Reliance Industries Ltd, India’s most valued company, is in the process of raising about Rs5,000 crore from LIC and other financial institutions, including banks. LIC had sanctioned at least Rs20,000 crore of debt this year, subscribing to NCDs, a structured debt product that cannot be converted into equity of the issuing company but which carries a higher rate of interest than convertible debentures. Shares of Tata Motors gained 1.46% to close at Rs153.10 on the Bombay Stock Exchange on Friday, while the benchmark index shed 2.87%. From the beginning of the year, the stock has lost 78.70% while the benchmark index has shrunk 55.81%. Tata Motors is part of the 30-stock Sensex.